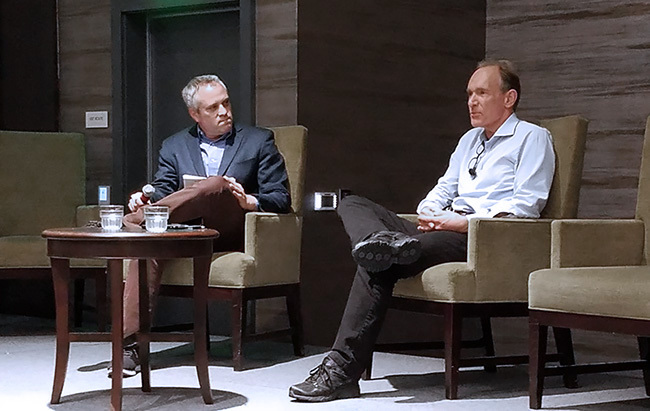 Technical promise, the intersection of humans and computers, and the past and future of the Web were explored during four exciting panels of executives, futurists, and inventors at the W3C Web Executive Forum on 8 November 2017 in Burlingame, CA. In Session 1: “The Future of Payments on the Web” Nick Telford-Reed, Director of Technology Innovation, Worldpay moderated a panel with global Executives: Karen Czack, Vice President, Industry Engagement & Regulation of American Express; Sang Ahn, VP & GM, Samsung Pay and Souheil Badran, President, Alipay North America. Telford-Reed, Czack, Ahn and Badran discussed the intersections of humanity, commerce, technology and trust. They outlined how, with the advent of the Web and Web Payment technology, the world is moving from the limits of physical currencies and boundaries toward global payments systems. 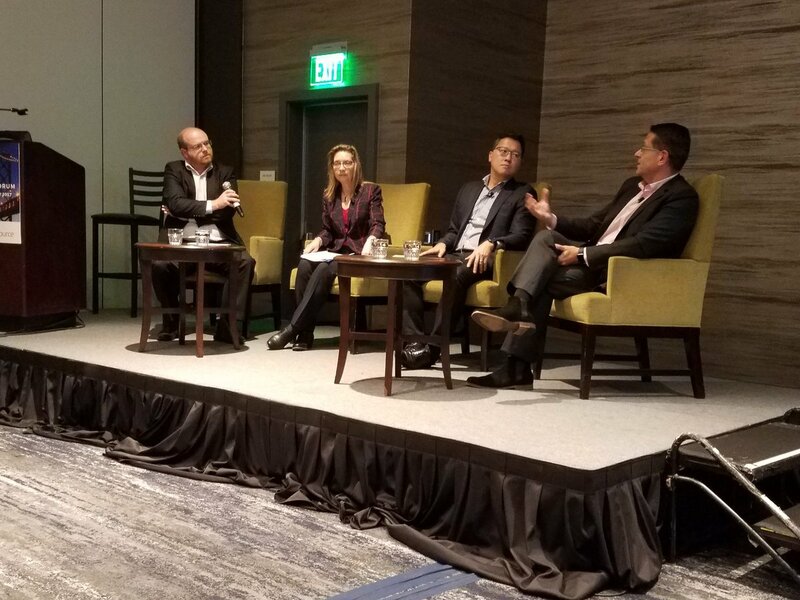 The panelists noted that while there is a great deal of exciting work happening in the area of Web Payments there is still a challenge to get where we need to be. They noted that good user experience and a high degree of security were vital for Web Payments. The panelists also noted that standards are very important to make sure that this work is done well. However, they said, as this work is needed right away companies who have a stake in the work should be at the table and participate. In Session 2: “Connected Cars, Cities and the Web” Steve Crumb, Executive Director, GENIVI Alliance, moderated speakers: Tina Quigley, Regional Transportation Commission of Southern Nevada; Steve Surhigh, Harman Connected Services; Dr. Scott Steedman, Director of Standards, BSI Group; and Patricia (Patti) Robb, Head of the Silicon Valley Innovation Center, Intel. 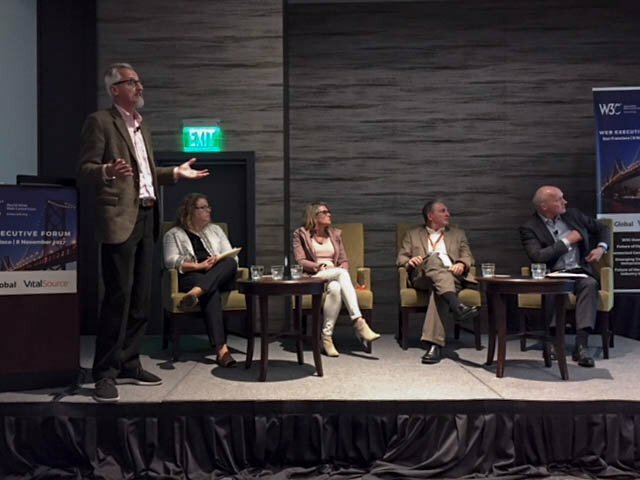 Surhigh, Robb, Quigley, Crumb and Steedman discussed the “triangle” of connected cars, smart cities, and citizens. They outlined the potential intersections of our cities, our cars, and all the data we generate as we move about the world. They emphasized how connected technologies can not just make our lives more convenient but safer. The panelists noted that as the world becomes more and more urbanized, connected technologies will provide huge opportunities for the next big businesses. 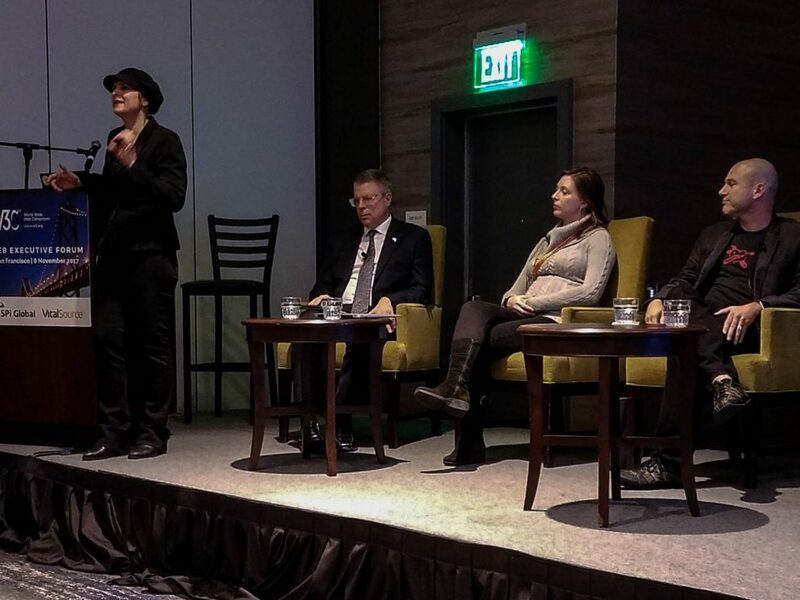 Panelists predicted that the data generated by our devices and vehicles will be an area ripe for opportunity. In addition, they said that the next step on from the “passenger economy” will spawn new services as well as productivity increases, fuel savings and fewer accidents. They emphasized that with an order of magnitude increase in safety, we have an opportunity to transform world of transport by saving lives. The panelists said that we need both cities and companies willing to pilot new technologies as well as standards organizations to drive implementation to accelerate value for users and to ensure quality and trust. Session 3 “WebVR, Emerging Trends: Seeing, Interacting and Securing the Future Web” was moderated by futurist Mark Pesce with speakers: Stina Ehrensvard, CEO & Founder, Yubico; Sean White, SVP, Emerging Technologies at Mozilla; and Megan Lindsay, VR Product Manager, Google. Ehrensvard, Pesce, Lindsay and White noted that the difference between the start of the Web and the Web today is striking and the differences we will see in 2040 will be incredible. The panelists predicated that WebVR, WebAR will make the open Web a place of exploration and innovation and be the biggest computing paradigm shift since smart phones, and warned however that security will be vital for the success of these new technologies and innovations. Panelists noted the importance of working with W3C to expand the Web beyond the screen. Session 4: “Web Future Impact” featured Bloomberg/Business Week Senior Executive Editor Brad Stone interviewing Web Inventor and W3C Director, Sir Tim Berners-Lee. Stone and Berners-Lee discussed the most urgent work for companies creating standards and the Web community. They noted the common worry that big tech companies have too much control. They discussed that they have seen over time the rise and decline of the influence and dominance of one big company, noted how these big influencers can impact the way we browse the Web, the news we see, what we find when we search, and even our democracy and voting. Berners-Lee and Stone noted that when there is a great deal of dominance by one company there can be reduced innovation for a time but then new companies come along and new innovations arise again. Stone and Berners-Lee discussed that as more and more people get on the Web the spirit of collaboration continues. They noted that continued collaboration between engineers and designers means the Web is an exciting place which is just as fierce, exciting and international as ever. They identified new tools for collaboration which increase this spirit of collaboration and what people are able to achieve together. Looking back, they did note that during the first 25 years of the Web, as the Web got more and more powerful, it was thought openness alone was sufficient for good to result. However, they said that now they see that we need to study the Web as a complex system, much like the brain, to be sure we are considering the unintended consequences of what we’re building on the Web. They declared we must ask whether what we build amplifies misinformation and nastiness, or goodness and truth. They stated the need to consider not just if a company is profitable but whether it is generating value for user. They warned we risk the standing of our country if the neutrality, openness and security of the Web is not protected. Stone and Berners-Lee urged that we all need to work to protect the Web, its neutrality and its openness. Please see Brad Stone’s article on the discussion “Father of the Web Confronts His Creation in the Era of Fake News”. Many thanks to the moderators and speakers of this event and special thanks to our superb producer, Karen Myers, from the W3C Business Development Team. It is very important to adapt according to the changing technology trends. The advancements in technology brings innovation, efficiency and saves time and resources. Every organization needs to work as per the latest technology advancements.